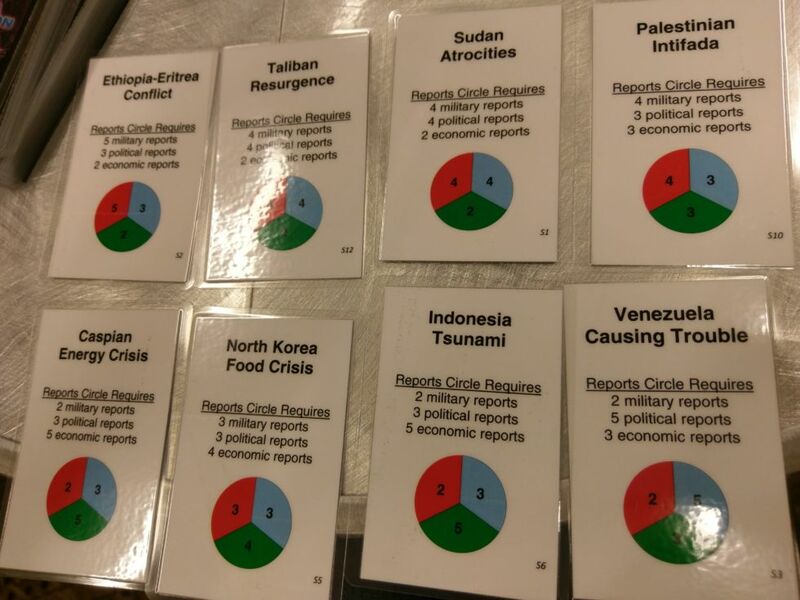 At SXSW, CIA Senior Collection Analyst David Clopper revealed a series of tabletop games developed as training materials for CIA internal training exercises: Collection, a Pandemic-style crisis-resolution game; Collection Deck, a Magic: The Gathering style intel-collection game; and Kingpin: The Hunt for El Chapo, designed "to train analysts who might work with law enforcement and other partners around world to find a well-armed, well-defended, well-protected bad guy." Collection compares favorably to the popular cooperative game Pandemic. In Clopper's game, a group of players must work together to resolve three major crises across the globe. The object is for players, who each represent different types of CIA officers, to collect enough relevant intel to resolve all three crises. If any one of the three impending disasters boils over (as represented by three increasing "fire" meters), the team loses. Every game must have at least three players to fill the roles of "political analyst," "military analyst," and "economic analyst." Those three are only able to collect intel in their specific fields, while additional players (up to seven on a team) have their own specialties. The difficulty comes from the low number of actions each player can do per turn, along with how quickly the fire meter ratchets up. Players can take two actions per turn: move your agent around the globe, foster new relationships in your current location, or attempt to acquire intel. The latter move is a dice roll. Those rolls are bolstered by having more relationships in a certain zone, by having fellow agents in that same zone (if they offer a specific "colocator" bonus), by having bonus cards, and by how good your relationship is with a specific agency. Let me be blunt: These boosts and bonuses are not doled out in ways that game designers would call "fair." This game is hard. That's how Clopper likes it.